شرح وامثلة اختصارات غير رسمية فى اللغة الانجليزية INFORMAL CONTRACTIONS. 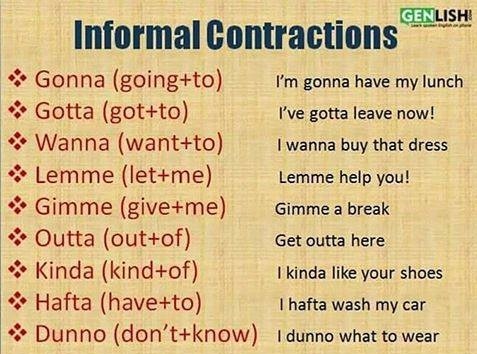 شرح INFORMAL CONTRACTIONS , تعليم اللغات الاجنبية من خلال موقع الطريق المضئ . اختصارات مع كلمة TO Contractions with "to"
We hafta ask for help. He hasta hire an assistant. ✏️Julia hadta cook dinner for her kids. Carrie useta smoke, but she quit. Didja get your hair cut? Couldja drive me to the store? ✏️Whadaya do about an overdue library book? ✏️Whadja think about the movie? اختصارات كلمة OF Contractions with "of"
It's kinda hard to imagine their lifestyle. A lotta kids are bilingual. ✏️Lotsa studies support bilingual education. ✏️Sheda liked more time to prepare. ✏️I doubt that heda been able to play so well if he hadn't practiced so often. ✏️Weda spent more time in Seville if we could have. ✏️Ida given it more thought before making a decision. ✏️She wishes theyda included more examples. ✏️Youda done the same thing if he asked you to. ✏️Cmon; we're leaving right now. ✏️You dunno what you're doing. ✏️Lemme help you with that. ✏️Could I have s'more cookies? ✏️She's gonna call you later. ✏️They wanna buy a house. ✏️We hafta ask for help. ✏️He hasta hire an assistant. ✏️Carrie useta smoke, but she quit. ✏️Didja get your hair cut? ✏️Couldja drive me to the store? ✏️It's kinda hard to imagine their lifestyle. ✏️A lotta kids are bilingual. Lotsa studies support bilingual education. You dunno what you're doing. Lemme help you with that. Could I have s'more cookies?